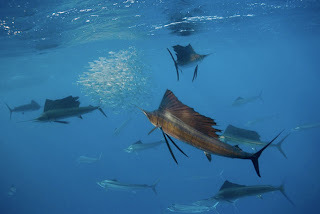 Sailfish (Istiophorus albicans) feeding on sardines. Photo by Douglas Seifert. In an earlier post, I introduced the concept of a wastebasket taxon - a dumping-place for usually largely unspecialised taxa that do not possess the distinctive characters to place them elsewhere. Sadly, the history of taxonomy has no shortage of examples of wastebaskets. Some of them have been progressively cleaned out in recent years; others remain sitting there in a jumbled heap, just daring reasearchers to have the courage (or foolishness) to take them on. Of all the enormous, ugly junk-piles in classification, however, perhaps none is more enormous or more ugly than the Perciformes. The Perciformes, as pointed out by many a textbook, is the largest by a considerable margin of all orders of fishes, and of vertebrates for that matter. There are over 7000 species of Perciformes of all different varieties, from tiny gobies to gigantic marlin and tuna. Go down to a beach, drop a fishing line into the water, and you can almost guarantee that the first thing you pull up will be a perciform. What makes all this diversity even more of an achievement, though, is that the order Perciformes doesn't really exist. Not in any way that actually makes sense. Not a single distinctive character unites all of the various taxa included in the Perciformes. As Gill & Mooi (2002) put it, "not only are there no synapomorphies to unite the order, it is not even diagnosable on the basis of shared primitive characters". As the saying goes, it's not even wrong. The oarfish or king of the herrings, Regalecus glesne, a basal acanthomorph. Oarfishes can be over ten metres in length. Photo by Gerry Smith. So if there's nothing to unite the order, what is it doing there in the first place? "Perciform" fishes belong to a clade called Acanthomorpha, the monophyly of which is well-supported. Among other things, one of the most easily recognisable features of the Acanthomorpha is that the first few rays of the fins have been replaced by hard spines. Within the Acanthomorpha, a number of distinct orders are recognised. 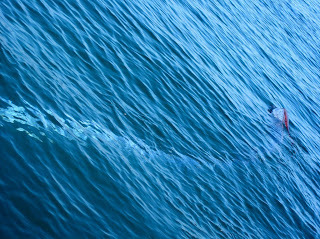 The dories of the order Zeiformes have a distinctive telescoping mouth that allows them to function as expert ambush predators. The pufferfishes and triggerfishes of the Tetraodontiformes, in contrast, have the bones of the mouth fused into a powerful beak for crushing hard prey. The flatfish of the order Pleuronectiformes have moved both eyes onto one side of their heads, and spend their days lying on their sides. But once these distinctive taxa have all been isolated - once you've taken out the fish that look like dories and the fish that look like puffers - you're still left with a large pile of fish that, well, just kind of look like fish. This pile is what you label "Perciformes" and pretend that you've somehow done something about it. Needless to say, being the association of acanthomorphs that aren't distinctive enough to be separated off, the Perciformes has varied on content quite considerably over the years. The very undefined nature of the Perciformes is also exactly what makes it such a difficult phylogenetic problem to solve. The phylogeny of the Perciformes is nothing less than the phylogeny of the Acanthomorpha as a whole - to solve one, you must solve the other. With nearly 15,000 living species of acanthomorphs, that is a colossal task. Still, a number of poor, foolhardy souls have made the attempt over the years. The advent of molecular analyses has improved matters, though there's still a lot of disagreement. The figure above shows a Bayesian tree from a relatively recent effort (Dettai & Lecointre, 2005). Support for a number of the clades found tended to be on the low side, but this paper and an earlier one (Chen et al., 2003) took the approach of analysing a number of separate datasets from different genes as well as the combined analysis, and seeing which clades were supported in which analyses (the theory being that a clade resulting from a number of different data sources is probably worth consideration even if the numerical support is not high every time). The clades with letters beside them are ones that appeared in a number of analyses. Though not strongly supported, this analysis agrees with others (both molecular and morphological) in recovering a basal grade within the the Acanthomorpha that includes Polymixia (beardfishes), Zeiformes (dories), Gadiformes (cods) and Beryciformes (squirrelfishes). Members of the "Perciformes" fall in a clade that runs in the tree above from Pomatoschistus (Gobiidae) to Cyclopterus, but this clade also (surprise, surprise) includes members of a number of other orders, and the Perciformes are polyphyletic. Some of the recovered relationships have been suggested before. Clade N, for instance, includes the Tetraodontiformes, Caproidae (boarfishes) and Acanthuroidei (surgeonfishes and allies), and relationships have been suggested on morphological grounds between Tetraodontiformes and either one of the other two groups (though, ironically enough, never both at the same time). Some of the relationships suggested by molecular analyses have been entirely novel - clade N also includes the Lophiiformes (anglerfishes), which might have been just about the last group one would expect to be related to puffers. The tree is also not without evidence of how far there is yet to go. Both Tetraodontiformes and Pleuronectiformes appear as polyphyletic, a result that is almost certainly complete twaddle in light of the distinctive morphological characters uniting members of these orders. The appearance of the opah Lampris in the middle of the Serranidae seems also pretty suspect to me (offhand, Lampris appears on the tree twice - I suspect the "Lampris" near the bottom of the tree is a misprint for Regalecus, the oarfish or king of the herrings). G. Nelson commented of fish phylogeny in 1989 that "recent work has resolved the bush at the bottom, but the bush at the top persists". That bush still needs a lot of topiary. Chen, W.-J., C. Bonillo & G. Lecointre. 2003. Repeatability of clades as a criterion of reliability: a case study for molecular phylogeny of Acanthomorpha (Teleostei) with larger number of taxa. Molecular Phylogenetics and Evolution 26 (2): 262-288. Gill, A. C., & R. D. Mooi. 2002. Phylogeny and systematics of fishes. In Handbook of Fish Biology and Fisheries (P. J. B. Hart & J. D. Reynolds, eds.) pp. 15-42. Blackwell Publishing. Is "wastebasket taxon" the preferred term downunder? I have always use "trashcan group" for that effect. It does seems to confer the idea that the taxonomic assemblage is, well, trashy.